Mellow in Monticello: A Thomas Jefferson Cocktail | Good. Food. Stories. Let’s arrange the menu, the venue, the seating for today’s installment in Good. Food. Stories.’ ongoing series of Hamilton-inspired cocktails—Mr. Jefferson, welcome home. Find more Hamilton-inspired gifts, including enamel pins, stickers, and greeting cards at the The Casey BarberSHOP. 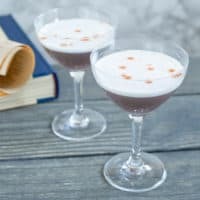 If I made a Thomas Jefferson cocktail based on every one of the historically significant moments he was involved in over the course of his lifetime, it would be something like a mille-feuille mind eraser, layer upon layer with accomplishments, schemes, and travails. In his own way, the man was non-stop, a Founding Father who was present from the birth of the new nation through the first rumblings of Manifest Destiny. Though Jefferson himself only wanted to be remembered on his tombstone as the author of the Declaration of Independence and the Virginia Statute for Religious Freedom, as well as the founder of the University of Virginia, there’s a lot more he (characteristically) omitted. What Jefferson did in his life was well-documented, but who he was is a question long debated by historians and scholars: famous for his reticence, yet leaving a forest of writings whose public proclamations and private feelings contradict themselves at every turn. And that’s where we find ourselves with this cocktail inspired by the gentleman farmer from Virginia. A velvety but maddeningly opaque drink with an undercurrent of bite, it’s an intriguing stunner that plays with the many contradictions in Jefferson’s life. Start with gin. 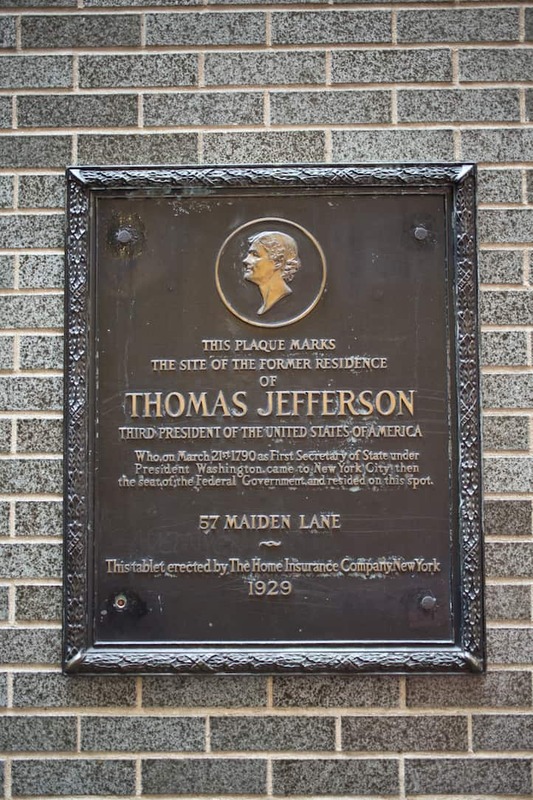 Yes, Jefferson stocked his personal cellars with Madeira and wine, but those spirits will make this drink look muddied and dark, and Jefferson was all about presenting the right outward impression. Choose a bottle with a botanical nose—avoid Hendrick’s, with its strong cucumber notes, for instance—and look for a more subtly herbal blend. I’m a fan of St. George’s Botanivore here. 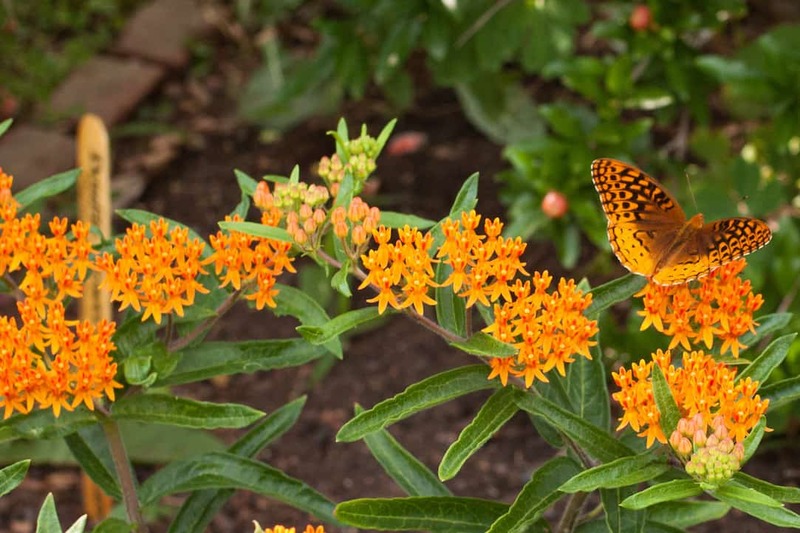 A few years later, Jefferson met the French botanist André Michaux and pressed President Washington to sent him west to explore the geography and botanical bounty of the territories (and, oh, along the way, set the stage for Western expansion). Though that mission never came to fruition, the same mix of scientific curiosity and private desires for empire building propelled the Lewis and Clark expedition. Likewise, the next ingredient—wheat beer—also speaks to Jefferson’s agrarian interests as well as his cloudy state of mind and tendency to mask his thoughts, even to the point of self-delusion. The examples to make here are almost too overwhelming: do we discuss how Jefferson’s belief that a strong federal government bordered on monarchical oppression went at odds with his biggest Presidential accomplishment, using his own executive authority to double the size of the United States via the Louisiana Purchase? His insistence on considering himself a simple farmer, even though the acres of land on his vast estate were not cultivated by his hands, but by the enslaved men and women that Jefferson also considered his property? Most obviously, what of his famous phrases that “all men are created equal” and entitled to “life, liberty, and the pursuit of happiness” when he was unwilling and unable to confront the realities of slavery throughout his lifetime? 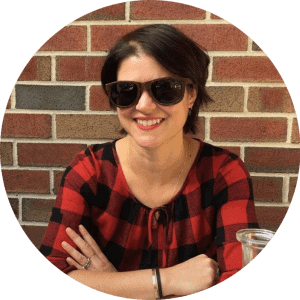 An unfiltered wheat beer, with its slightly sweet flavor profile and hazy hue, represents this dichotomy between “the head and the heart” wherein Jefferson’s mental utopia is sullied by historical hindsight. If you can, pick a beer from a Virginia brewery, like Port City’s Optimal Wit. 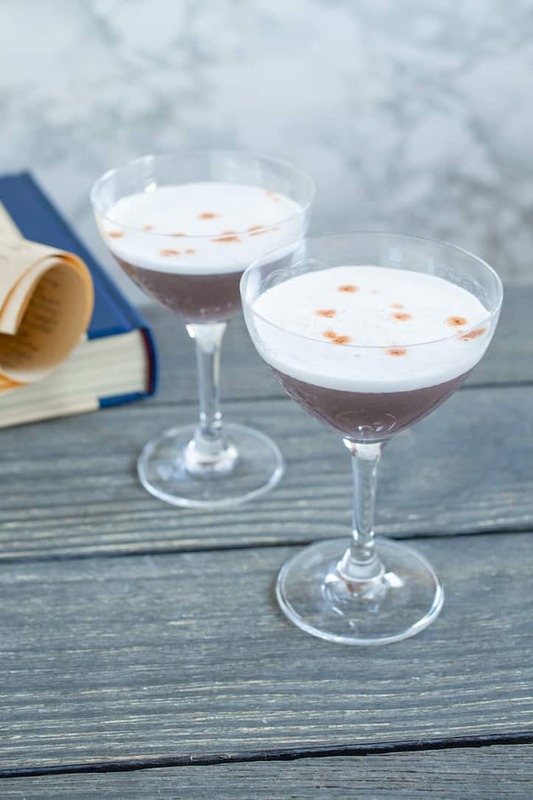 Creme de violette lends the cocktail its color and its connection to Jefferson’s time in Paris. Though the liqueur itself is Austrian in origin, using violets plucked from Alpine meadows, sweet and syrups made from floral essences, including roses and violets, had been popular in Europe since the Renaissance. Creme de violette is refined elegance in a bottle. And it’s got the same hue as those Paul Tazewell costumes. **fans self** Countering the floral sweetness of creme de violette is ginger syrup, the sharp-tongued antagonist that keeps the drink in balance. Its warm spiciness sneaks up on the palate, giving a lingering burn to each sip. Plus, Jefferson was a ginger, and I couldn’t resist making that reference. 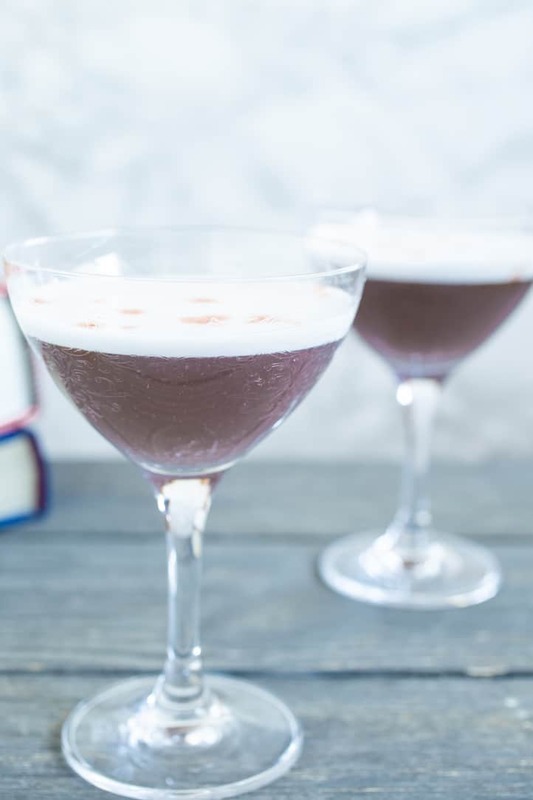 Finally, the velvety texture of the cocktail comes from the inclusion of an egg white, the ingredient that gives shaken drinks their luxurious foamy crowns and rich mouthfeel. It’s a slippery ingredient that requires you to get your hands dirty, which is something Jefferson never wanted to do in the political sphere. Whether it was the back-room dealings he orchestrated as de facto leader of the Republican faction, all the while publicly swearing that he detested the idea of political parties, his cover-ups of his sexual relationship with Sally Hemings, or his machinations to move the seat of government from the urban, financially-centered states of New York and Pennsylvania to the shores of the Potomac, Jefferson relied on Madison, James Monroe, and members of the press to send messages, spread rumors, or clap back at the Federalists. So if you don’t want to touch the egg white yourself, get James Madison to do it for you. (And save the extra egg yolk for spaghetti carbonara in honor of Jefferson’s love of pasta. The final result: a deceptively smooth cocktail that slowly reveals its complexity, just like the man from Monticello. 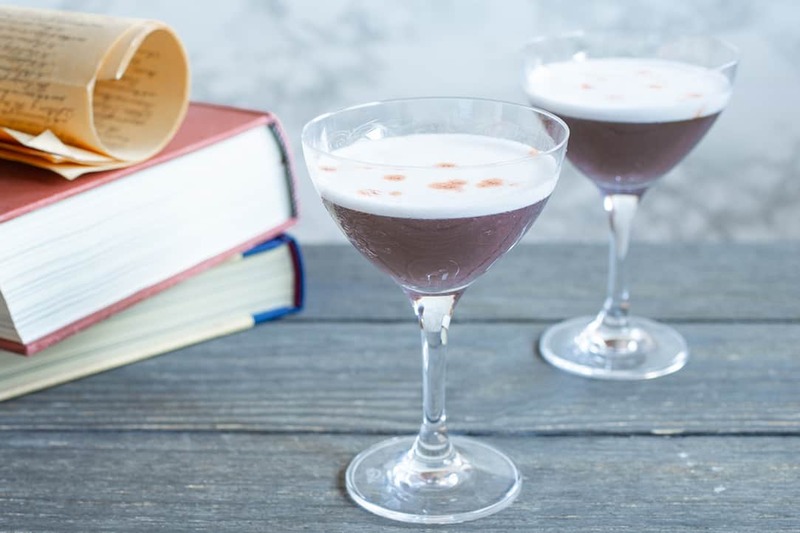 Inspired by the many contradictions in the public and private life of one of our most enigmatic Founding Fathers, this Thomas Jefferson cocktail uses a host of intriguing ingredients to examine the man from Monticello. Pour the gin, beer, creme de violette, ginger syrup, and egg white into the base of a Boston shaker. Seal and shake vigorously for 45 seconds to 1 minute. Unseal the shaker and add a handful of ice cubes. Reseal and shake for 30-45 seconds more. Strain through a Hawthorne strainer into two architecturally appropriate coupes or other cocktail glasses. Shake a few drops of Angostura bitters onto each cocktail and serve.